In order to be eligible for the competition, non-professional chefs and bakers were asked to share their favorite original family recipe and then get creative by adding a citrus ingredient to give it a unique citrus twist. Entrants were also asked to share a special memory or family tradition associated with their recipe. The Resorts’ Executive Chef, Kurtis Jantz, and his culinary team scoured through volumes of recipes received and selected the top three as finalists. These recipes were featured at our Annual Mother’s Day brunch, where attendees voted on their favorite recipe based on taste, creativity and visual appeal. Thank you to everyone who submitted recipes and participated in this years’ contest! Directions: Cut jalapeños into 12 slices. Mix together the sugar and the corn syrup in a skillet and bring to a boil over medium high heat. When it has boiled for about 4-5 minutes remove from the heat and stir in the jalapeños. Using a skewer, remove from the hot liquid and transfer to a parchment lined baking sheet. Bake peppers in a 350 degree oven for 10 minutes. Roll jalapeños in sugar while still hot then return to pan to cool. Directions: Create a work station near wok or skillet with high sides. Place on work station counter cleaned dried chicken chunks on a large plate. In a small shallow bowl, mix 2/3 cup cornstarch, ground red pepper, salt and garlic powder together until combined and place alongside chicken plate. In an additional small bowl, whisk 1 tablespoon peanut oil, 2 tablespoons orange juice and 2 egg whites together until blended and frothy and place alongside seasoned cornstarch bowl. Line a large cutting board or platter with wax paper and place on work station counter closest to wok or skillet. Preparing chicken chucks in batches, first coat chicken in liquid egg white mixture to moisten, then dredge chicken in cornstarch mixture and toss until coated well and place prepared chicken onto the lined cutting board or platter. Continue chicken process until all chicken chunks is prepared. Heat 1/2 cup peanut oil in a wok or skillet with high sides to medium-high, (350 degrees F.). Place a large platter or plate that has been lined with several sheets of paper towels near wok or skillet. Cook prepared chicken chucks in batches in heated peanut oil and fry until lightly golden brown. Add additional 3/4 cup peanut oil when needed, 1/4 cup at a time, to continue frying chicken chuck batches are completed. Place completed cooked chicken chucks onto paper towel lined platter or plate to drain excess oil. When wok or skillet has cooled completely, wipe clean with several sheets of paper towels. Heat 2 tablespoons peanut oil to medium heat level, (325 degrees F.) Add carrots, onions, red peppers, broccoli, ginger and white wine and cook 2 to 4 minutes, or until vegetables are tender and wine has reduced. In a small bowl, whisk remaining 2 tablespoons cornstarch and chicken stock together until blended. Add cornstarch chicken mixture, remaining 1/4 cup orange juice, soy sauce, heavy cream, grated orange peel and sugar to vegetables and cook an additional 1 1/2 to 2 minutes, or until liquids have thickened slightly. Remove wok or skillet from heat and add in prepared chicken chucks in with vegetables and sauce and toss to combine, let stir-fry cool slightly for 5 minutes or until rested and set. Spoon Vietnamese Citrus Chicken Divan Stir Fry over onto a large serving platter and sprinkle over top with slivered almonds. Meanwhile, prepare rice noodles. In a stock pot or large 5-qt. Dutch oven that has been filled with lightly salted water bring to a rapid boil. Add rice noodles and cook according to package directions, or until noodle are al dente. Drain noodles in cold water. Place cooked noodles in a large serving bowl and toss in remaining 1 tablespoon peanut oil and melted butter until noodles are lightly coated. 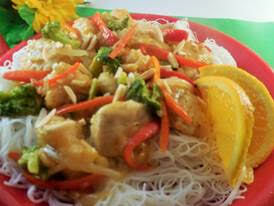 Serve and enjoy Vietnamese Citrus Chicken Divan alongside cooked buttered rice noodles. Place a couple half-moon orange slices each on individual servings for optional garnish. Directions: 1. Coat a non-stick 10" tube pan with cooking spray. Dust with flour and then tap out any excess. 2. In a medium mixing bowl toss the raisins with the Amaretto. Let the flavors meld for about 30 minutes. 3. MAKE THE CAKE: Preheat the oven to 375 degrees. In a large mixing bowl, sift together the flour, sugar and baking powder. In another large mixing bowl, whisk together the melted butter, milk, eggs, egg yolk, lemon and orange zest and juice and vanilla and almond extracts. 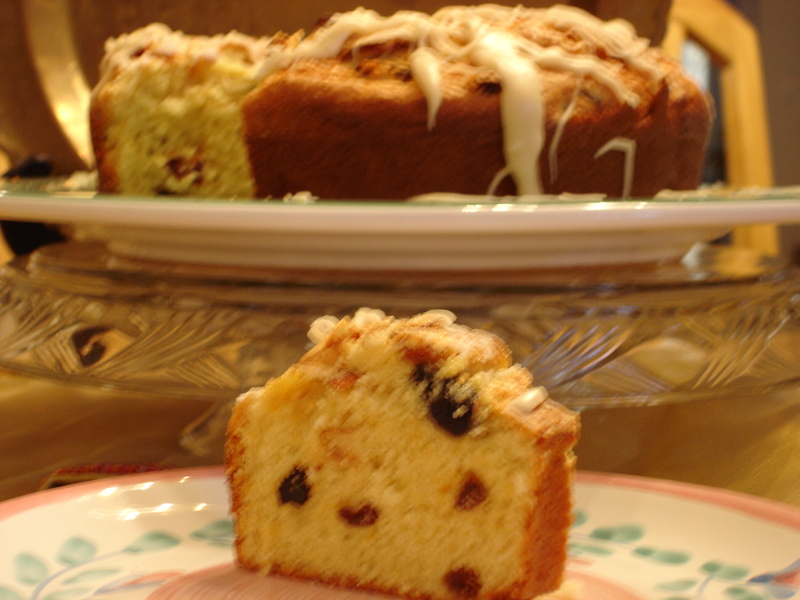 Drain the raisins (set aside) and whisk the excess Amaretto mixture into the butter mixture. 4. With a rubber spatula, add the butter mixture to the flour mixture and stir until all the ingredients are well blended. The batter will be thick. Gently fold the reserved raisins into the batter. Spoon the batter evenly into the tube pan. 5. MAKE THE TOPPING: In a small bowl, mix the almonds, egg white, sugar and lemon zest until evenly combined. Spread evenly over the top of the batter. Bake the cake until golden brown, about 20-30 minutes, or until a tester comes out clean. Do not over bake. Let the cake cool 15 minutes before removing from the pan. Cool completely before icing. 6. MAKE THE ICING: In a small saucepan add the confectioner's sugar and Amaretto. Whisk until smooth and pourable; about 1 minute. Add a few drops of water if too thick. Immediately drizzle over the top of the cake using swirl motions. The icing hardens almost immediately so work quickly. Serve immediately. Serves about 16 people 45 minutes prep time. 30 minutes bake time, 1 hour cool time.